As the end of the year approaches, people and organisations may decide to make a New Year resolution to give more to charity. But the ways individuals and organisations can become involved in philanthropy are changing. City University London recently hosted a half-day symposium to discuss the opportunities and challenges for the third sector presented by the digital revolution and advances in technology. 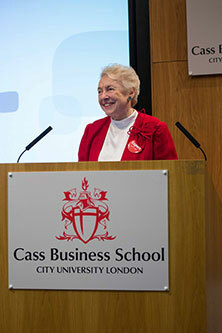 Forming part of the Digital Shoreditch Festival and hosted at City's Cass Business School, the event attracted several high profile panellists, including celebrated philanthropist, Dame Stephanie (Steve) Shirley. Her keynote speech on her journey and experiences of giving was described in several tweets and comments from the audience as "inspiring." Dame Shirley emphasised points such as "let your money stand for who you are", "giving is a social activity not a financial transaction", "we create our legacy not by what we leave behind, but by how we live" and "the more I give, the richer my life seems to become." Introducing the event, City's Vice-Chancellor, Professor Sir Paul Curran said, "How City gets giving emerged from a growing awareness among several Digital Shoreditch backers, including City, the City of London Corporation and private sector partners, that 'tech for good' businesses and investors have taken hold recently in London in a distinctive mini-cluster." "Through various strategic partnerships such as Digital Shoreditch, City has long been a champion of the Tech City cluster and I'm delighted to help explore how we can work together to maximise the impact of philanthropy and giving in a digital age." The event was anchored by two main discussions. Firstly, Tech City Insider editor Julian Blake introduced entrepreneurs who explained how their organisations are addressing issues such as social change and youth unemployment. Maggie Morgan, of social enterprise project Fixers, showed how her team supports young people to address social problems by developing and championing the art of digital storytelling. In her words: "Fixers are young people using their past to fix the future. They are motivated by personal experience to make positive change for themselves and those around them." She gave the example of a 'fixer' who had taken a chance at a level crossing, been injured and then made a video about safety at all crossings to help change young people's, sometimes daredevil attitude, towards them. Sinead MacManus, of startup Fluency, then explained how her business connects young unemployed people with the rising number of vacancies for digitally skilled employees in Tech City. Fluency introduces young people to the kinds of vacancies that are becoming available and then helps them acquire the necessary skills to make successful applications, often liaising with employers as part of the process. As Sinead put it: "There's a digital job for everyone". The session's second panel addressed the opportunities and challenges for social and impact investment, picking up on the need shared by all kinds of enterprises to call on many funding sources to achieve sustainability and really make social progress. Angel investor Suzanne Biegel chaired a panel including Dan Sutch of Nominet Trust, William Makower, founder of the National Funding Scheme, DONATE, and Cass's recently appointed Social Investment expert, Mark Salway. The panel brought together their complementary insights on trust, grant and seed funding; venture and equity funding; corporate grant making and investing; and other options, such as crowd funding. They offered the entrepreneurs in the audience their perspectives on pathways to growth, with an emphasis on aligning to funder needs, high quality planning and objective-setting and on awareness of the diversity of choice in business models. The audience took away a clear message that in a technology-informed world the boundaries previously perceived between non-profit organisations and businesses are dissolving away. Social investors are also increasingly agnostic about business structure or choice of vehicle, preferring to paying attention to the impacts and consequences of a for-good activity.